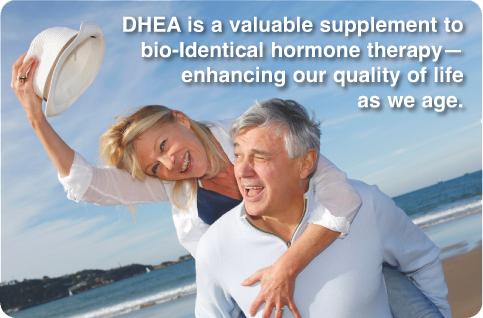 When using DHEA therapeutically and supplementally, quality matters. The only acceptable form of DHEA is micronized (for better absorption) and sustained-release (release over time). I generally use a compounding pharmacy for this, and I add pregnenolone. This ends up being less expensive than using either separately. I also use it in my capsuled hormone formulations, along with Estrogen, Progesterone, and Testosterone. “Dehydroepiandrosterone (DHEA) and its sulfated form dehydroepiandrosterone sulfate (DHEAS) are the most abundant circulating steroid hormones in the body. It improves physical and psychological well-being, muscle strength and bone density, and reduces body fat and age-related skin atrophy, stimulating procollagen/sebum production. In adrenal insufficiency, DHEA restores DHEA/DHEAS and androstenedione levels, reduces total cholesterol, improves well-being, sexual satisfaction, and insulin sensitivity, and prevents loss of bone mineral density. In animal studies, low levels of DHEA have been associated with age-related involuntary changes, including reduced lifespan. Extrapola-tion of animal data to humans has turned DHEA into a ‘super-hormone’ and an ‘anti-aging’ panacea. It has been aggressively marketed and sold in large quantities as a dietary supplement. Recent double blind, placebo-controlled human studies provided evidence to support some of these claims. In the elderly, DHEA exerts an immuno-modulatory action, increasing the number of monocytes, T cells expressing T-cell receptor gamma/delta and natural killer cells. In systemic lupus erythematosus, DHEA is steroid-sparing. In an unblinded study, it induced remission in the majority of patients with inflammatory bowel disease. DHEA modulates cardiovascular signalling pathways and exerts an anti-inflammatory, vasorelaxant and anti-remodelling effect. Its low levels correlate with increased cardiovascular disease and all-cause mortality. DHEA/ DHEAS appear protective in asthma and allergy. Low levels of DHEAS accompany adrenal suppression. It could be used to screen for the side effects of steroids. In women, DHEA improves sexual satisfaction, fertility and age-related vaginal atrophy (used by many of our patients). Many factors are responsible for the inconsistent/negative results of some studies. Over-reliance on animal models (DHEA is essentially a human molecule), different dosing protocols with non-pharmacological doses often unachievable in humans, rapid metabolism of DHEA, and organ-specific differences render data interpretation difficult. It is unlikely that there will be large-scale, randomized, controlled trials, as DHEA is non-patentable, meaning no billions for the pharmaceutical industry. However, I’ve found it to be a valuable supplement in our bio-identical hormone therapies. I look forward to assisting you in exploring life enhancement and proactive anti-aging. Call Dr. Lang, ND, ABHRT, for an appointment at (406) 586-1100. To learn more about services, visit TheVitalLife.net. Office at: 19 N. 10th Ave., Suite 2, Bozeman. Facebook: thevitallife.